When Bass Culture Records launched in 2009, the name was already heavily steeped in Club folklore. 1997 saw the birth of the now legendary, ‘Bass Culture’ parties at Paris’ Rex club, and the monthly party has now become the longest running event in the club’s history. The musical programmer and figure-head of both night and label is of course, D’Julz. Whether its through his productions, radio shows, compilations, parties or club sets, D’Julz has been at the forefront of electronic music since his career first began back in 1992. A firm DJ and fan favourite alike, his ability to transcend genres and trends has seen him maintain one of the most consistent levels of success of any modern day DJ/Producer. A run of form that is at its strongest, today. In its fourteen releases to date Bass Culture has welcomed a variety of talent, yet till now has hosted the mercurial beats of its boss only the once; On the edit of Anonym‘s “Lov Is Easy”. Today’s “Fofoca” EP sees D’Julz confirm once again just why he and his music are held in such high regard, with three exclusive new cuts from the Frenchman. Title track “Fofoca” with its marching bass and rasping hats is the perfect opener. Its ecstatic gasps are countered by the shrill wail and its rapid-fire snares. 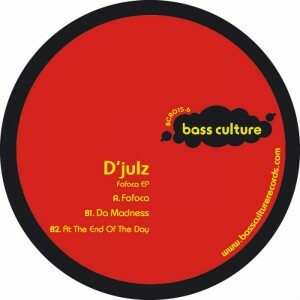 “Da Madness” again sees D’Julz working the Hats, as its hypno-bass is joined by the intensifying synth pulse and its Jamaican vocal speaks an industry truth as ‘Da Madness’ takes hold. Closing the EP is aptly titled “At The End Of The Day.” Its classic drum patterns and popping bassline combine to create a wonderfully oldschool soundtrack that is set to win the hearts of the new school. This entry was posted on March 16, 2011 at 14:38 and is filed under Release.